Each time you make a reservation through this website, your reservation is made directly with Athina Villas. As such, you are guaranteed the lowest possible rate, unlike reservations made through third party systems (whose prices include the given platform’s commission). To send a reservation enquiry directly to Athina Villas click here! "Athina Villas" is located in a wonderful area, at the top of the green hills of Karyotes village with a lovely sea view on Lefkada island. 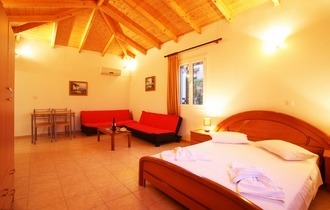 It is just 4km (2 1/2 miles) from Lefkas Town and 1 1/2km (1 mile) from the central Lefkada-Nidri road. The complex consists of 3 small villas (40sq.m. / 430sq.ft.) that can accommodate from 2-4 persons and a maisonette, (80sq.m. / 860sq.ft.) that can accommodate up to 6 persons. All the units are recently renovated and offer a high standard of services, privacy and quiet. A perfect balance between cost and quality.